This set comes with 3 separate graphics as well as a full image as displayed without background. Cupcake shop owner, baker character design. Cupcake Shop Owner Avatar. 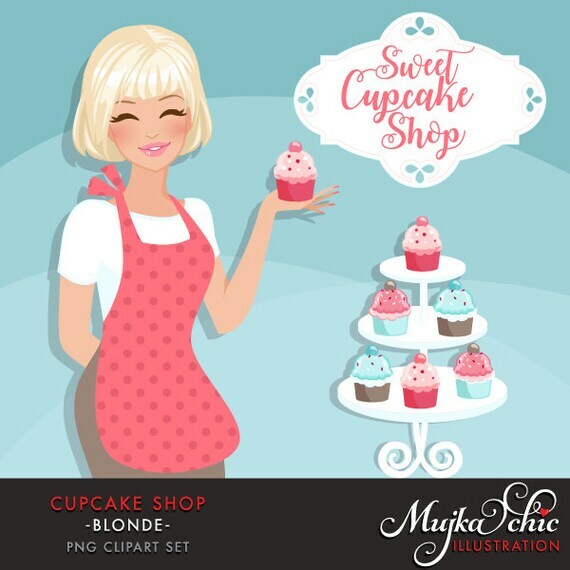 Blonde woman holding a cupcake character. Use on Party Invitations, Social Media, Blog, Website or on stationary. Small Commercial Use is included. Design can be used up to 1000 copy on digital or physical products such as Baby Shower Invitations. No mass production, web template or print on demand use ( Zazzle, Society6, Threadless..etc) allowed. Cannot use as a LOGO itself or part of a LOGO design and RESELL to others. You can use it for your own logo design and other branding materials. No sharing or reselling allowed. Please read my TOU attached in the gallery image for further information.